was created in 2006, in response to the limiting restrictions imposed by commercial and typical art galleries. The goal of Upper Room is to create a space and place where we have the freedom to express ourselves spiritually and with artistic integrity in how our work is viewed and sold in the marketplace. All of the Upper Room artists are represented and sold by various galleries and museums around the world, but in this specific gallery of the Upper Room, we come together as fellow artists to speak collectively about issues that matter deeply to us, and to our art making. is a non-profit business of the Christian Cultural Development Foundation, established by artist & missionary Robin Haines Merrill. 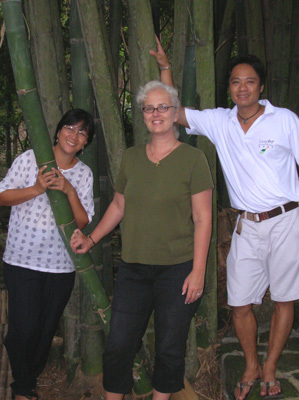 Wendy Fernando-Regaldo, Robin Merrill & Jim Orencio, amongst the bamboo in Silangan Gardens, Antipolo, Philippines. The Upper Room Art Gallery is a non-profit collective of artists & designers whose artwork specializes in organic and recycled materials and who are concerned with global poverty, social justice and environmental issues.